I woke up at 4:30am on Monday the 5th of June. I was having Braxton Hicks, that weren’t all that uncomfortable, but of course I couldn’t go back to sleep. Like my first pregnancy, I never had any pre-labor signs in the weeks or days before baby came. When they started, it would lead to contractions, which would lead to baby. So, I had a feeling that we would be meeting this little girl by the end of the day. It was the early, quiet hours in the morning, where everyone else is sleeping, and I could hear the soft snoring from my husband, our toddler and our two dogs. I laid there thinking about how this was probably the last time I would be sleeping next to my husband and two-year-old son alone. She was pretty active at that point, so I thought about how this could be the last time I ever felt her move around before she was born. At around 5:30am my husband’s alarm went off and we both got up and jumped in the shower. We talked about how I was having Braxton Hicks and if he should go to work or come along to my appointment with us. We were in a bit of a dilemma because we had decided to make the four hour trek to Baby and Co from Alabama, so he couldn’t just go in to work real quick if it turned out to be nothing. We decided he would go to work, and I would call if I felt like he needed to get on the road. At 6:30am, our moms were up and getting ready to head to the appointment. I didn’t want to alert them, so I didn’t mention the Braxton Hicks. I just said that they should pack a go-bag just in case we ended up staying up there. At 7:00am, my husband headed off to work. The moms and I packed up the truck to head towards Baby and Co. About an hour into the drive contractions started to get a little more intense and seemed to even out. I stopped to get gas (and pee of course) and I quickly downloaded a contraction tracker app. We tracked contractions for the rest of the drive, and when we got to Baby and Co. around 11:00am they picked up a little more. I went in to my scheduled appointment at 11:30am with Sarah (the midwife on shift for appt’s) and told her that I was having Braxton Hicks since 4:30am and that now they were contractions that seemed to be starting to fall into a pattern and get more intense. I told her that this is how it happened with my first, and that I didn’t think I’d be going home today. We chatted for a bit, and then I went in and met with Taneesha (the midwife on call). She checked me and said I was at 2-3cm and it could be any time. I told her the same thing I told Sarah, that I really thought I should stick around and not go back home. We agreed that I would go to lunch and try walking around and then come back for a 2:30 appt to check my progress. It was right at 12:00pm, and I called my husband and told him to go ahead and leave work, pick up our bags from the house, and head this way. We drove over to the mall about 15 minutes away and decided to eat at the Cheesecake Factory (I had never been there, and holy cow, it’s amazing). By the time we got our food, ate, ordered dessert for the road, and paid it was already 2:00pm so we just decided to head back to Baby and Co. I didn’t get any walking in, and I was incredibly nervous that I wasn’t going to have progressed very much. Contractions had gotten way more intense since being there, but I really thought that they would send me home. At 2:20pm we got back to Baby and Co., and I was walking in the lobby waiting to get called in by Taneesha. I told my mom that I wished my husband could just pull over and hitch a ride on a helicopter, because I felt like it was picking up quickly (boy, was I right). I went to the bathroom and 2:25pm and lost my mucus plug. I came out of the bathroom and Taneesha was having me go into the little room to be checked. I told her about losing the plug, and she said, “that’s a good sign.” So, while she’s checking me, I feel a weird, uncomfortable gush (best word to describe it). Her eyes get big, my eyes get big… she looks under the sheet and says, “I think your water just broke.” I couldn’t think of what to say, I was so embarrassed, I just said, “Can I stay now?” She laughed and said, “Yes, we’re going to keep you.” I was moved into a labor room around 2:45pm, and I knew things were going to pick up and get super intense (the way that had with my first when my water broke early on), so I texted Kailee and let her know what was going on. Taneesha came in and said she forgot to tell me I was at 4/5cm. I let Kailee know, and she said she was going to start getting ready and head our way. I asked Taneesha for a notepad and pen so my mom could take notes during this process. I asked for my earbuds and started listening to my labor playlist on my phone and started pacing in the labor room. I went to pee and contractions got super intense. I got up on the bed on all fours and contractions just because super intense, very fast. I only lasted for about three of those with my mom putting pressure on my hips, and I got down because it was just too crazy. At around 3:30pm, I had my mom ask Taneesha to fill up the tub, and I got on the yoga ball next to the tub. At 3:37pm, my mother in law called my husband and said he was about 50 minutes out. At 3:45pm, the tub was ready, and I got in, and immediately had a contraction. My two-year-old came over and held my hand (be still my heart). Taneesha called for Taylor, the nurse, and says, “she’s really uncomfortable (understatement), so we’re close. Go ahead and come in.” My husband called to check on progress at 3:48pm, and my mother in law tells him it’s intense, so we’re getting close and the photographer has been called. Taylor came in at 3:53pm, and I said “I want Lute (my husband). I can’t do this without him.” Taneesha asked if I want them to get him on speaker, and ask much as I wanted to, I said, “No, I don’t want to distract him from driving.” Kailee walked in at 3:56pm, and Taneesha says, “You better get over here, we’re about to have a baby.” In between contractions I kept saying, “I need Lute… I can’t do this without him… where is he…”, and Taneesha finally said (and I will never forget this), “It’s okay, she’s going to come into the world surrounded by a circle of powerful women.” And with that I felt the urge to push and it was a big push. At 4:00pm, baby was crowning and I kept saying I couldn’t feel my hands, my mom was behind me and grabbed my hands and told me to tuck my chin down. I followed her command, and went into the second big push. At 4:02pm a third and final push brought our daughter earthside. Taneesha brought her up to my chest and Taylor put a warm blanket on her. She had a head full of hair and was incredibly peaceful. My first words to her were “You are the most precious thing ever.” I called my husband and told him the news. Because he wasn’t there yet, I cut the cord at around 4:11pm after it had stopped pulsing. Placenta delivered naturally at 4:14pm and they helped me out of the tub and over to the bed at around 4:18pm. I asked my son if he had a sister now, and he said, “No… baby.” My husband arrived at 4:27pm and he took our son and we had a moment. This was our last baby, and with his arrival the four of us were together for the first time and we were complete. Pure magic. So, even though we had the birth we wanted and the best OB any woman could hope for, it was just not the ideal place to have a baby. 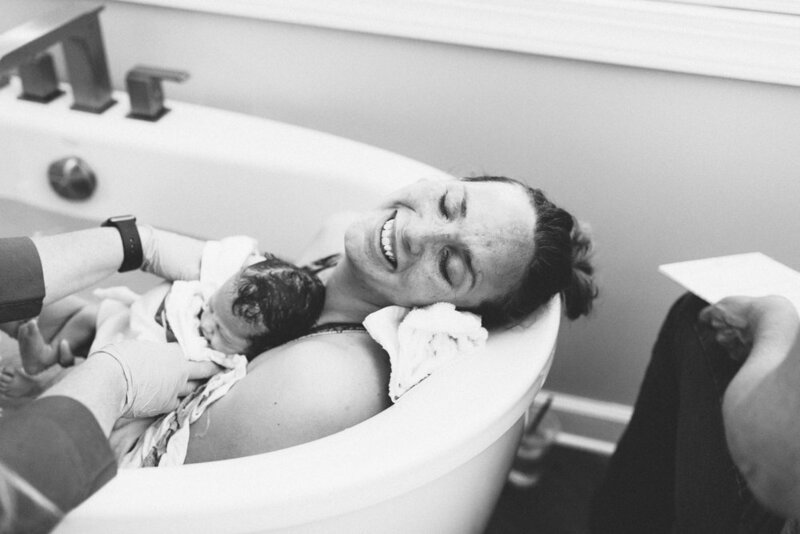 We knew that options were extremely limited in Alabama, and as much as I wanted a homebirth for the second and final baby, we didn’t want to do it the only legal way, which was without a medical professional attending (absolute insanity). We talked to our OB and I bawled, but he was so graceful and told me it was absolutely up to me and he understood and supported my decision. 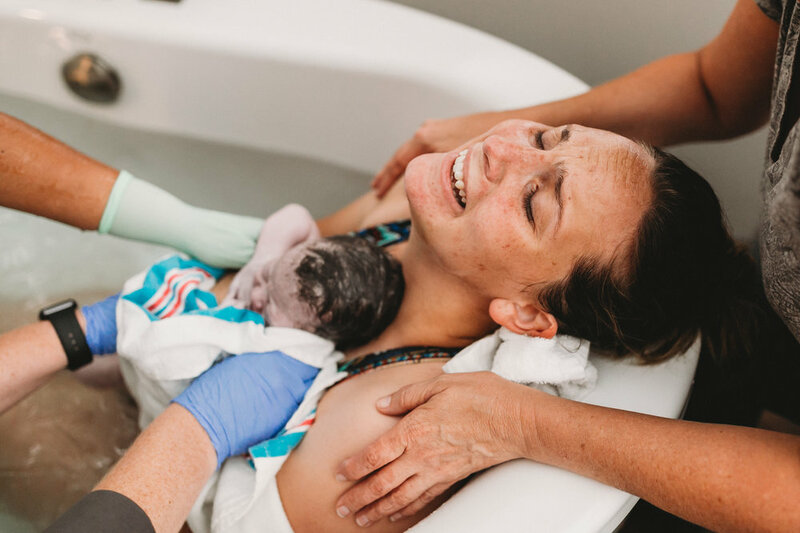 We found Baby and Co. and Kailee Riches, and knew that this was our best team for making our last baby’s birth story the best possible it could be. 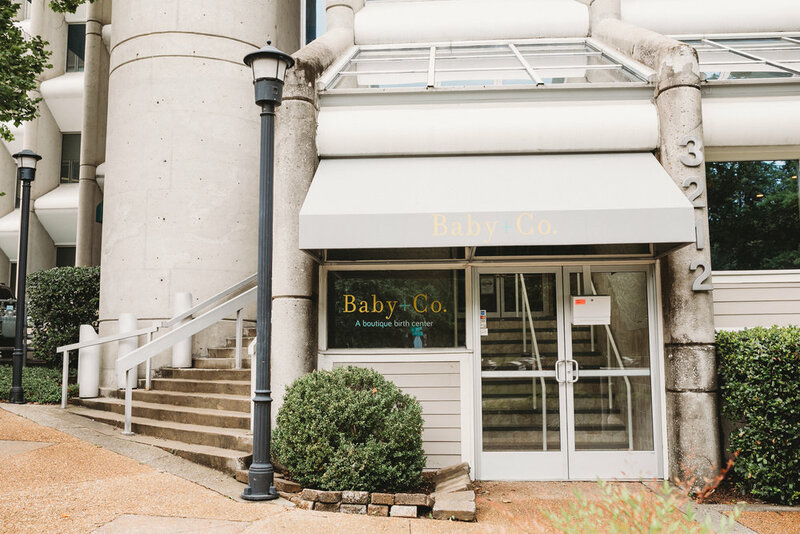 I can’t thank Taneesha and the rest of the ladies at Baby and Co. enough for the amazing experience there. They seriously made me and my family feel at home every time we went. They knew we had a long drive, and were so accommodating about our needs. We loved them. We are so glad we saw Kailee’s birth photography book sitting on their coffee table and flipped through it our first appointment. We knew right then that this was the place and we wanted her as our photographer. I know she arrived only six minutes before the baby did, but she absolutely captured the best moments of that day. My family will cherish these photos forever. I just started offering these gorgeous engraved 4x6 print boxes with USB. 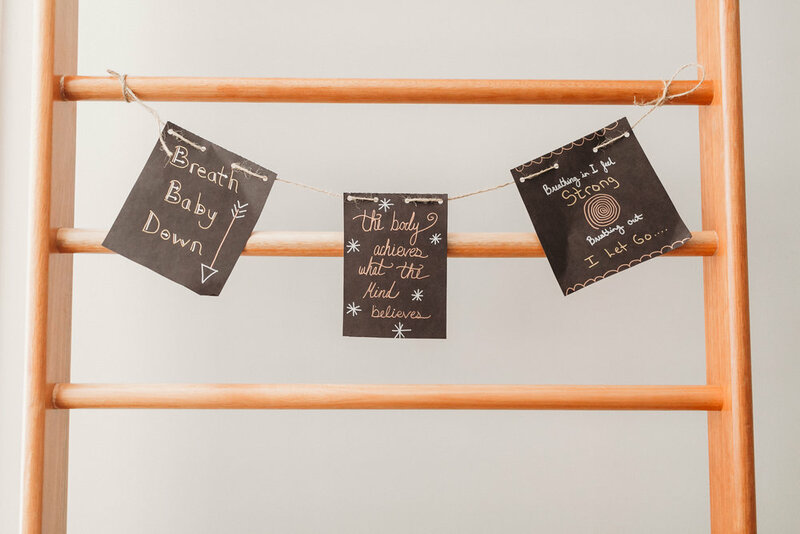 These beautiful handmade keepsakes are now available for birth and portrait collections.